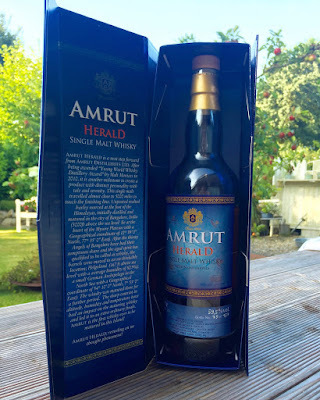 Amrut Herald Cask #1271 (59.5%): This cask is aged in Bangalore for five years before got moved to the island Helgoland in the North Sea for an additional 18 months. It yielded 157 bottles only... There were a few sibling casks distributed in Europe, mainly in Germany and all of them are long gone. Obviously Amrut is looking for alternatives to age their whiskies longer by moving the casks to a colder climate and lower altitude and I wouldn't be surprised to see new releases in similar fashion in future. 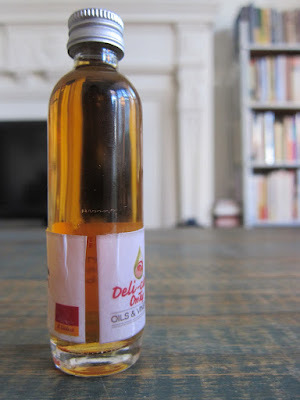 Nose: Strong alcohol, white wine vinegar and ground ginger. Airing clears alcohol, now all sweet: almond cookies, vanilla and flan. After adding water I get baklava syrup, cinnamon, and hard wood furniture. Toffifay candies, spiced rum and honey. One of the sweetest noses I remember lately. Palate: Hot... Cinnamon, cloves and nutmeg. Water needed. Caramel filled chocolate bars, molasses and Mexican hot chocolate. Oak is very dominant... Not exactly like an old Scotch but more like a small barrel aged bourbon. The longer it airs the more cocoa and pepper notes fill in. Red pepper flakes and milk chocolate. Hot chocolate is still there... And old school chewable vitamins C tablets. Finish: Gosh... It is long with hot paprika, cocoa, burnt milk and toasted oak. Overall: Don't be shy when adding water to this dram. The whisky also benefits from airing quite a lot. I personally would be more interested in a cask which spent less time in India but more time in Germany... Who knows, maybe we can see a release like this sometime later. It is a great whisky. All the Amrut sweetness and spiciness we would expect but even more concentrated. Well, like I said I hope we will see more Amrut bottlings from the island Helgoland. Thanks again to Jens Fischer for the sample and for the photograph you see above.